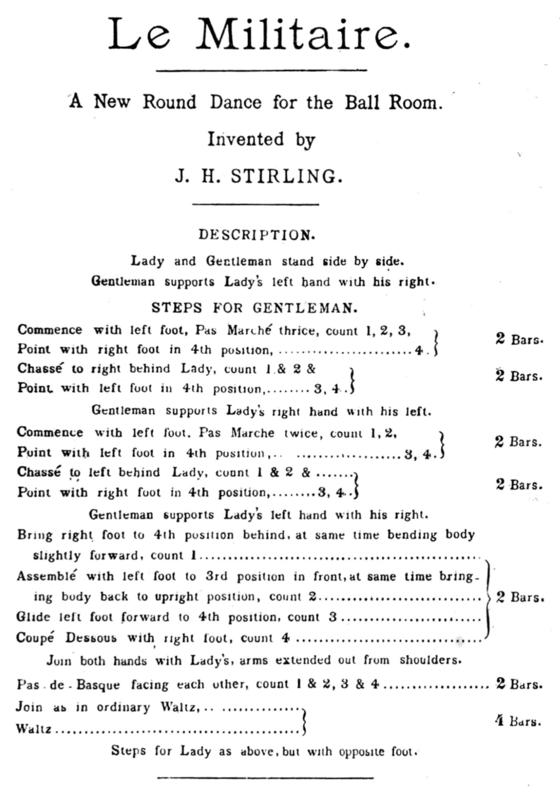 This is an early English sequence two-step composed by J. H. Stirling in 1905. Part I - Walk and Point (2 bars): Starting outside foot, walk three steps (1, 2, 3) and point inside foot forward (4). Part II - Change and Point (2 bars): Starting inside feet, chassé into partners place (Lead behind Follow) (5-and-6), then point new inside foot forward (7, hold 8), taking new inside hands. Part III - Walk and Point (2 bars): Starting inside feet, walk two steps (1, 2) and point inside foot forward (3, hold 4). Part IV - Change and Point (2 bars): Starting inside feet, chassé into partners place (Lead behind Follow) (5-and-6), then point new inside foot forward (7, hold 8), taking original inside hands. Part V - Balance Back and Forward (2 bars): Glide inside foot back, inclining forward slightly (1), then bring outside foot back to meet it, without weight, heel to instep, straightening up (2). Glide outside foot forward (3), then undercut it with inside foot, turning to face partner (4). Part VI - Pas de Basque (2 bars): Taking both hands, pas de basque along line of dance (1-and-2), and against LOD (3-and-4). Parts VII and VIII - Two-Step (4 bars): Two full turns of turning two-step in closed position (1-and-2, 3-and-4, 5-and-6, 7-and-8). There's an eponymous tune composed specifically for the dance by Brigata Bucalossi, but any square, early 20th century two-step will work nicely. J. H. Stirling. (1905). 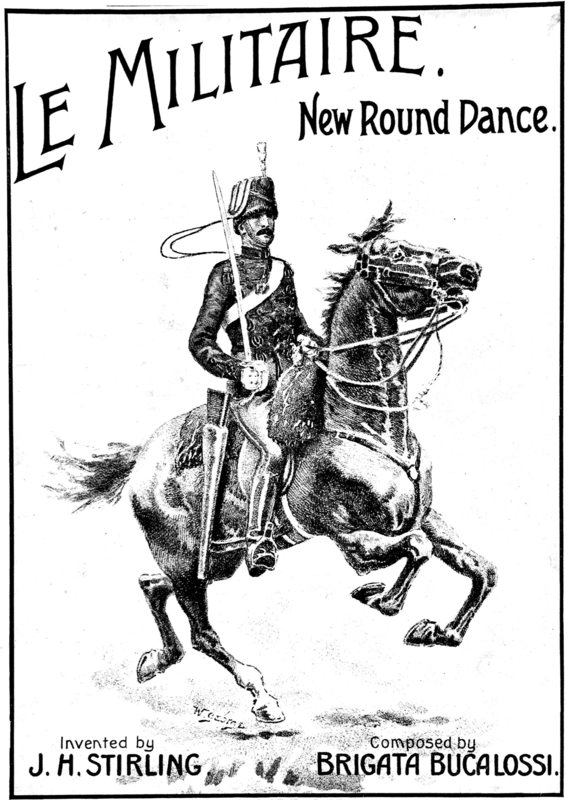 Le Militaire, New Round Dance. London. A. J. Latimer. (1948). A Bouquet of Old Time Dances. London. Sydney Thompson. (1950). Old Time Dance Book. London.